I read Asperger’s Syndrome and Difficult Moments to learn respectful methods of helping my overwhelmed son. One of the most helpful interventions was “proximity control.” This formal sounding action is simply being next to an Asperger child without engaging with them. Your presence is felt, but does not require specific interaction for either of you.. Adult Aspies benefit from proximity control. I feel agitated and restless when I am alone. Having the kitty for company is soothing, but having my husband blinging away on the guitar is best. Many women married to Aspies struggle to understand why their husband wants to have them nearby. My father likes the same quiet company. Before he retired, he faithfully earned a living for his family. The anxiety he coped with on a daily basis would give the most courageous pause. After work, my mother’s companionship settled his nerves so he could sleep and go to work the next day. As a child, my mother emphasized how much of a Southern Gentleman Dad was. He would not touch his food till she sat by his side at the table and picked up her fork. Despite father’s impeccable cordiality, I know his behavior runs deeper than upbringing. Dinner is simply more delicious with Mom beside him for company. Aspies and neurotypical people both crave company. But we preffer differnt types of company. 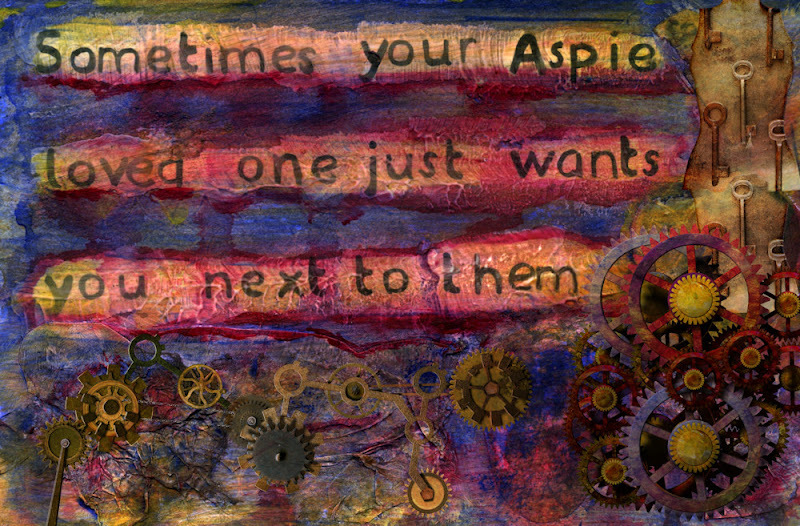 An Aspie’s ideal companion is subliminal. We don’t need words to maintain companionable peace, being is enough—as if radiated body heat bears secret messages only we comprehend. Too much talking clutters our minds and disturbs our mental symmetry. My husband and I share a tacit harmony. We don’t make small talk or ask polite questions. We address relevant issues; make plans, and express affection. Goofy interludes persist. We sense each other’s presence across the household. Each knows the other is close by—this is a comfort. Sep 14 2011 May 11 2013 Lori D.
Thank you Charles! I appreciate your comment, I am happy to be understood. Merci, Charles. J’apprécie votre commentaire, je suis heureux que vous comprenez. wow this really helps me. My son always wants me with him and this gives me a perspective on it. It helps so much to understand these little bits of behavior. When you realize that the origin is neurological, it helps to dissipate confusion. It is srtange that a fair amount of Asperger’s consists of feeling slightly lost, disoriented. A loved one is often both their compass and anchor. Thank you for visiting and letting me know this article helped. It makes my day! Proximity without words, without direct interaction just ‘being there together’… I think that it my preferred mode of socialising. It has a calming quality and is non-intrusive yes very bonding. I guess that’s part of the reason it is so relaxing to have our dogs around. My husband prefer to have me around while he works (on his laptop), he says it helps him concentrate. I actually feel the same way – I work better having him nearby, provided he doesn’t interrupt me and doesn’t require my attention. Oh, yes! We are like that too! You are welcome:-) Thank you for writing! I get you with the 80%… Sounds familiar.